First off my apologies if you have that dreadful song stuck in your head. Every time I mentioned the name of this recipe my husband turned into Homer Simpson. "DOH, now that song is stuck in my head again". I really can't stand that song. It's right up there with "Midnight at the Oasis" and "Hey Mickey" on my list. Your list may vary. So even if you have that awful song stuck in your head, and even though you might be singing it while you make this, and even while you serve it, and then you'll curse yourself for it, it's worth the torture. 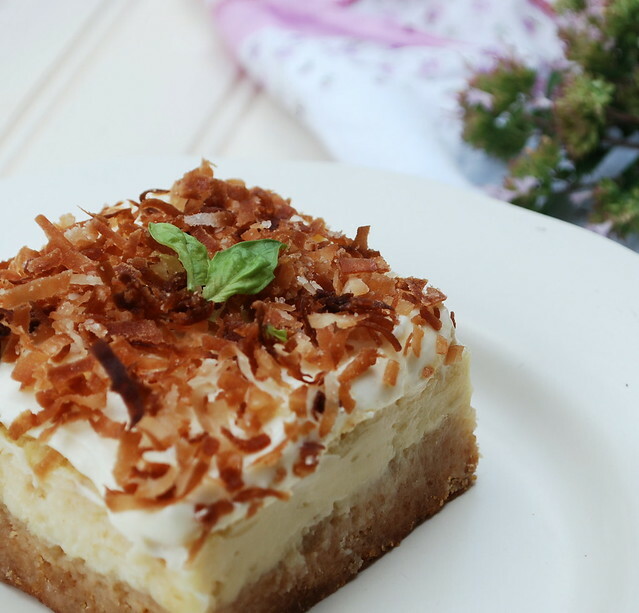 If you like key lime pie, you will love these. 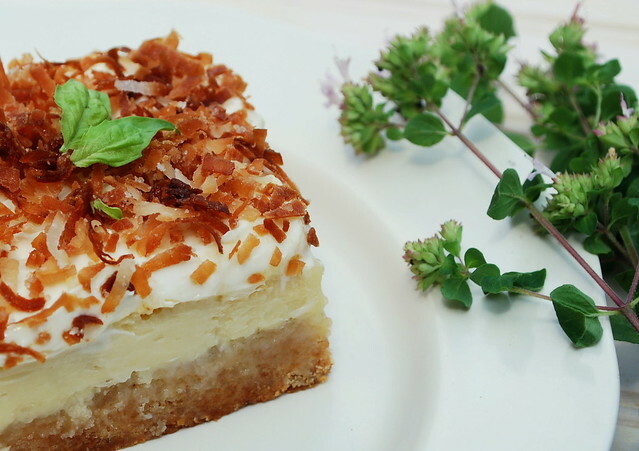 If you don't like key lime pie, I would shy away from this recipe. For you key lime lovers let me tell you this....this is refreshing and tangy and the perfect ending to a warm summer night. (Yes, technically it's still summer folks). This is where I changed things up a bit. I’m not a fan of canned frosting (sorry Mrs. Crocker) so I chose to use this lower-fat version from Chocolate & Zucchini. 1 ¼ cups marshmallow crème (7oz) - just use the whole jar. Heat the oven to 350. Spray the bottom and sides of a 9x13 in pan with cooking spray. In a large bowl stir the cookie base ingredients until a soft dough forms. Press evenly in the bottom of the pan. Bake 15. DON'T OVERBAKE. Take it out when it still looks under cooked. Cool 15 minutes. Meanwhile, in a large bowl beat the cream cheese with an electric mixer on medium speed until light and fluffy. Beat in the cream of coconut until well blended. Beat in the lime juice, vanilla and the eggs. Mix until smooth. Spread over cookie base. Bake 40 to 45 minutes or until set and light golden brown on edges. Cool 30 minutes at room temp. Refrigerate 1 hour to cool completely. Combine all the ingredients in a medium size bowl and beat with an electric mixer at medium-high speed until smooth and fluffy. Spread on cooled bars. I absolutely love key lime pie, so I know I'd love these! OMG Lisa - my mouth is watering. 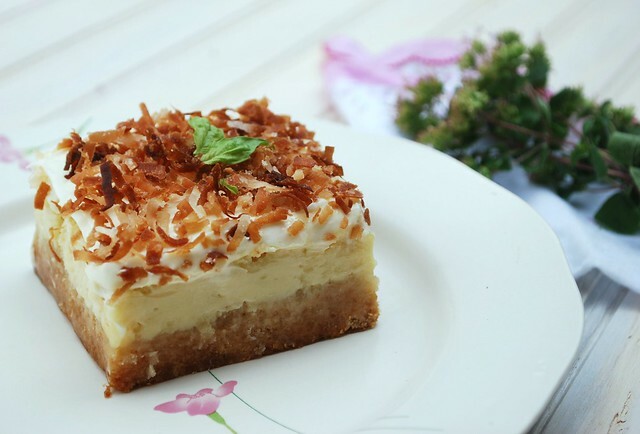 I love lime and coconut and these look amazing. I'm sure toasting the top layer of coconut gives it a great flavor. Worst song ever...Come on Elene by Dexie's Midnight Runners OR I Touch Myself by the Divinyls. Wow... those look amazing!!! I will definitely be trying those as soon as I find that coconut goodness in a can.